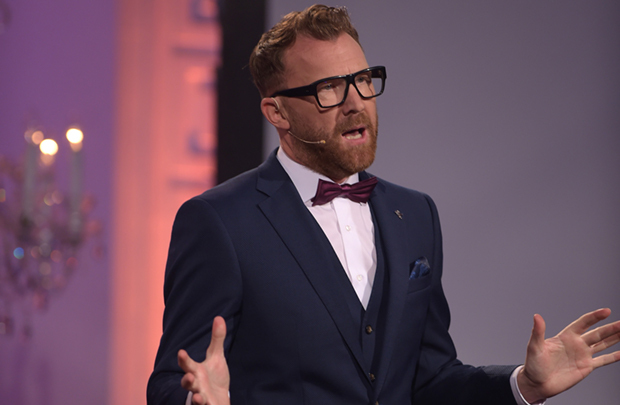 The IFTA Gala Television Awards will be broadcast on TG4 on this Saturday 2nd June at 9.25pm. Marty Morrissey picked up the Gala TV Presenter of the Year Award; Dancing with the Stars was a popular win for Best Entertainment, as was Gogglebox for Best Reality; TG4XXBeo Won Best Live Event. The Factual Award went to Dermot Bannon and the team at Room to Improve. John Connors spoke from the stage about his IFTA winning documentary Travellers. Over 600 leading Irish people from entertainment, broadcast and television were in attendance to celebrate the prestigious ceremony, which awarded the highest quality talent with much-coveted IFTA statuettes this evening. After a jam packed and buzzy red carpet in the sunshine with the stars of Dancing with the Stars, Miriam O’Callaghan, Amanda Byram, Nicky Byrne, Des Bishop, Tommy Tiernan, Lucy Kennedy, Baz Ashmawy, and Sharon Horgan, 23 Academy categories were presented, with winners including Fairy Tale of New York which won the Specialist Factual category; Gogglebox which won Reality for Kite Television. Derry Girls which won Best Comedy and Best Writer for Lisa McGee; Chris Walley who won Best Male Performance for The Young Offenders (collected by Alex Murphy), Sharon Horgan won Best Female Performance for Catastrophe. Red Rock won the Best Soap Award for the third year; the hugely popular Room to Improve won Best Factual show; Shaw My Astonishing Self won Single Documentary presented in association with BAI. Fir Bolg the popular Irish language comedy/drama starring Sean McGinley won the Best Irish Language category. BBC Newline won the IFTA news award for their news coverage of the death of former deputy first minister Martin McGuinness and during her acceptance speech Donna Traynor paid tribute to the producer who had passed away last year. RTÉ News and Current Affairs won the best current affairs category for RTÉ Investigates: Nightmare to Let. It was a great night for Irish Television; celebrating a great year for Irish television. The Irish Academy welcomed professionals to the RDS this evening from both in front of and behind the screen, from actors and directors to producers, writers and leading figures from Ireland’s broadcasters, whose work was celebrated throughout. In the third Awards ceremony dedicated exclusively to honouring television talent, sponsored by Gala Retail, Shay Healy was awarded with a Lifetime Achievement Award for his incredible body of work spanning over five decades. The presentation of the Lifetime Award to Shay Healy was made by Nicky Byrne and John McColgan. The official title Sponsor of the IFTA Gala Television Awards is Gala Retail.